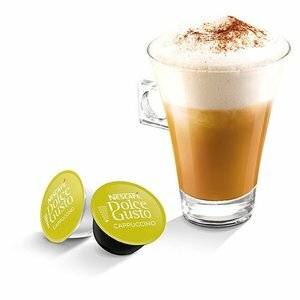 The balance of dark roasted coffee, milk, and touch of sugar means theres nothing you need to add to this great little coffee capsule. Less milky than a latte and more easy going than an espresso, the smooth texture of a cappuccino is something you simply cant forget once youve tried it. And now you dont need a barista in your kitchen to enjoy it every day, as thanks to the maximum 15 bar pump pressure in your NESCAFE Dolce Gusto machine that coffee shop taste is always within reach. The ideal cappuccino is sophisticated but laid back, easy to drink, and just the right temperature to sustain its unforgettable flavours. 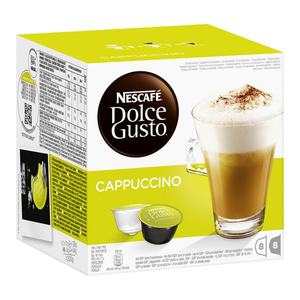 This makes it a staple of any enthusiasts NESCAFE Dolce Gusto pod collection, popular with friends and family and absolutely ideal for kicking back and relaxing when you need a break.